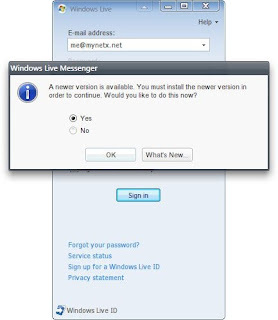 If you are not running Windows Live Messenger 2009 yet (14.0.8089.726), you have to upgrade now. The server-side support for Windows Live Messenger 8.5 (2008) has been retired. The next time you sign in, you will get to see a dialog like the screenshot the left side. The Windows Live Messenger team has identified an important security issue in Messenger 8.5. All Messenger users need to upgrade to the new version. Note : If you are running Portable Windows Live Messenger Lite 8.5, it will not work anymore. You'll need to upgrade to Portable Windows Live Messenger 9.